Iraqi Prime Minister Haider al-Abadi on Thursday fired the head of the military in southern Basra province who is accused of the death of 18 demonstrators killed early this month amid ongoing popular protests against the government over poor public services. Lieutenant-General Jamil al-Shammari has been demoted to the post of rector of Iraq’s Defense University for Military Studies, according to a statement of the Prime Minister’s office. Abadi had to sack the Lieutenant-General who has been subject to public criticism for his handling of protests in the province, which have been demanding better public services and a clampdown on corruption. Eighteen demonstrators were killed early this month as the protests continue. The removal, Turkish state-run news agency reports, came hours before the Iraqi parliament was scheduled to vote on whether or not to dismiss the commander. Also on Wednesday, the agency notes, MPs called for the dismissal of three ministers in al-Abadi’s government. 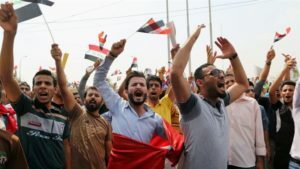 Basra, the heart of Iraq’s oil crescent, has been since early July the epicenter of the deadly demonstrations, which have also engulfed central provinces. Written by: KanelkaTagba on September 28, 2018. Posted by KanelkaTagba on Sep 28 2018. Filed under Gulf News, Headlines. You can follow any responses to this entry through the RSS 2.0. Both comments and pings are currently closed.